Here in Houston there are many different types of water heaters that will work great for you home. On demand & tankless type heater is great for people who will be in their home for long periods of time because of all the gas savings. However regular hot water tanks and electric hot water tanks are great also if your in the home for a shorter period of time. 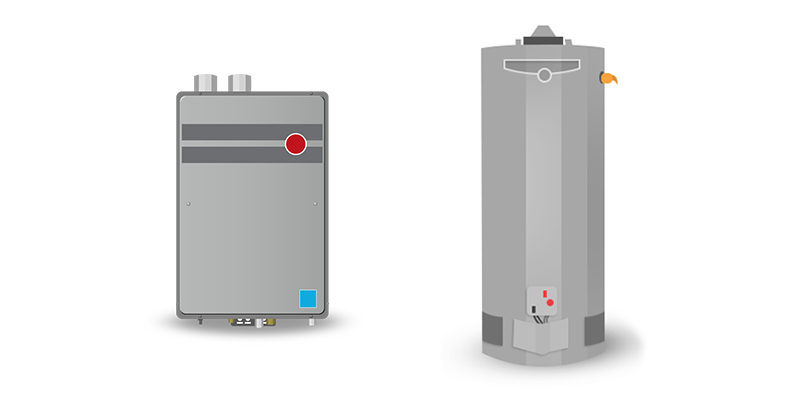 No matter what type of water heater you are looking for – we have you covered. Contact FurnaceUSA today to learn more or visit our FurnaceUSA Houston page to see all the products we feature. With a new water heater from FurnaceUSA you skip all the wasted time, markups & overhead of the traditional heating and cooling industry. No longer will you need to have a salesperson in your home to quote you on a furnace, heating or cooling system – let our technology based solution save you time and money and we’ll quote you online! FurnaceUSA water heater service is a commitment to providing high-quality service and replacement options for HVAC units at affordable prices. When you have a problem with your water heating system, call in a professional company. We are a team of skilled technicians who are well aware of all repair and installation options of the heating system. Our licensed and skilled HVAC technicians will first come and check the problem and give you a quote. If the heating system needs replacement, they will recommend the best heating systems for your house and make sure to meet the highest service standards. Our water heater installation services deliver results and you will notice your water heater price for maintenance and service go considerably down with our repair options. No hot water problem is off-limits for us and we repair all brands of appliances such as Bradford White, Rheem, AO Smith, Noritz, Bosch and Navien. In Houston, we can take care of both residential and commercial plumbing and give you the best plumber. Whether you want your sewage line cleared, or want a water heater repair, or want water heater leaking fixed, or want water heater installation, our specialists will do a professional job without charging you a lot of money. The water heater is an important part of your heating unit. Whether you are facing problems with your 50 gallon water heater, or the 40 gallon water heaters, we are the number one choice for all plumbing repairs and replacements in the Houston area. When it is time to service or replace your HVAC appliances choose the most experienced HVAC experts in the neighborhood so you can get the job done right and within your budget. Our technicians know all the HVAC units and parts available in the market and will work according to your directions. We will first inspect your units and check for the need for replacement or repair and give you an estimate. Everyone looks for an HVAC solution that is also affordable. Our broad range of services comes with affordable fee plans and our repaired appliances allow you to make savings on your energy bills. You can get significant savings with heating even though first installation costs at times are higher. Get a quote or estimate for an HVAC solution for your house from FurnaceUSA if you are in the Houston Area. Give us a call and get a free quotation for all HVAC appliances repair and replacement plans. We will be glad to come to your property and inspect the repairs and installation needs for you. We give a range of services on demand water heaters evaluations. Visit us online and reach out for our free consultation services. Houston is our favorite place to work in and we will reach your doorstep with a complete HVAC repair plan to fix your hot water heater Houston problems at affordable prices. FURNACE USA – YOUR HOUSTON WATER HEATER INSTALLATION & REPAIR EXPERTS!